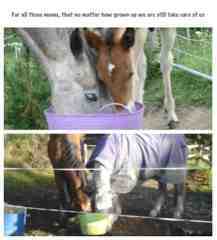 the wild horse project: Happy mothers day! Just a quick Happy Mothers Day, to all the fantastic mothers out there. Also to one little wild horse who to this day is the best equine mother I know.Even though her baby is weaned and grown, towering over her, she delights in taking care of him and sharing her feed every morning.